Self-service or on-demand support? What would you choose for your product /service support? According to this HBR article, 81% of customers across industries attempt to solve problems themselves before reaching out to a customer service representative. But, you guessed right. Of course, it is not a question of one versus the other. It is, rather, about striking the right balance between the two forms of support, and enabling a smooth experience for all stakeholders- the customer, the support agent, and the business. Self-service, comprising chatbots, online knowledge base, FAQs, IVR, self-checkout facilities, and any other support platform that does not have a human behind the scene, is about instant solutions to customer issues. 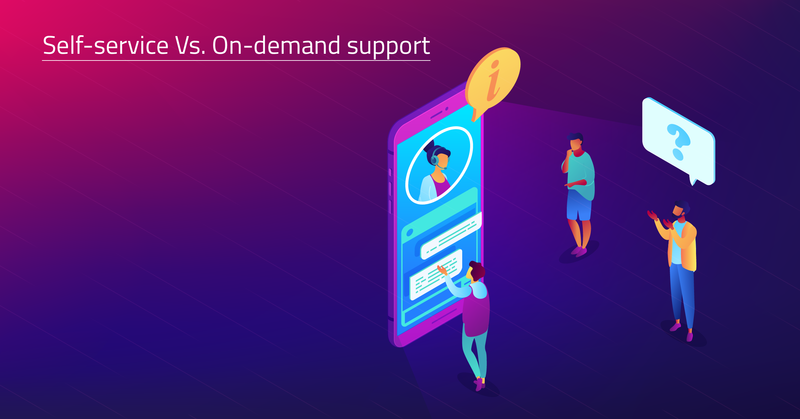 On the other hand, on-demand support built on a one-on-one interaction with the customer is about personalization and human touch. While the former may help field quick service questions, the latter is necessary for handling escalations. Both support frameworks have their pros and cons. For instance, while self-service enables easier scaling, it lacks the contextual feedback that a real-live human can offer. Both platforms need to be used in such a way that they complement each other. The answer lies in integration. And it is important that you train your customers and agents to optimally and comfortably tread this integrated support milieu. Here are some pointers on the right tools and practices that can help you go about this reorientation with ease. Armed with an analytics driven enterprise software, you can collect quantitative data on various customer issues, the optimal resolution steps, touch points, and timelines. By making this data available on the self-service portal’s FAQ pages, knowledge articles, and help pages, you can provide clear directions to customers and equip them to solve their queries. Alternately, you could facilitate public forums, and link relevant discussions / threads to appropriate FAQs, and articles. This way. you end up building and nurturing an authentic community around your product / service experience. Clearly communicate the support process to your customers through messaging that is clear and concise, across all your engagements. Let them know all the right resources. This breeds familiarity and sets the foundation for strengthening your standard practices. Lastly, let your customers know that you are always available. Make one-on-one support readily accessible at any point where the customer is not able to resolve their query themselves. In the end, it is all in the people and the process.